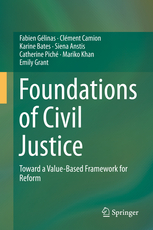 Foundations of Civil Justice: Toward a Value-Based Framework for Reform | Catherine Piché, Prof.
Fabien Gélinas, Catherine Piché et al., Foundations of Civil Justice: Toward a Value-Based Framework for Reform (New-York: Springer, 2015). This book reviews the knowledge corpus about access to civil justice across disciplines and legal traditions and proposes a new research framework for civil justice reform. This framework is intended to foster further critical analysis of the justice system in a systematic and organized way. In particular, the framework underlines the tensions between different values considered as central to the civil justice system, and in doing so potentially allows for conscious, reflected and enlightened choices about the values that are to be prioritized in the reform of justice systems. Ce contenu a été mis à jour le septembre 8, 2015 à 20 h 18 min.